In just about a week I will be sharing the latest and greatest in technical debt techniques through a Cutter webinar in which colleague John Heintz and I will be speaking . In a little over a month a special issue of the Cutter IT Journal [CITJ] on technical debt will be published. And, in a couple of months Jim Highsmith and I will deliver a workshop on the subject in the Cutter Summit. Shifting from the process to its output (i.e. the code) is the common thread that runs through the three events. Rigorous that your implementation of the software process is, the proof of the pudding is the quality of the code your teams produce. 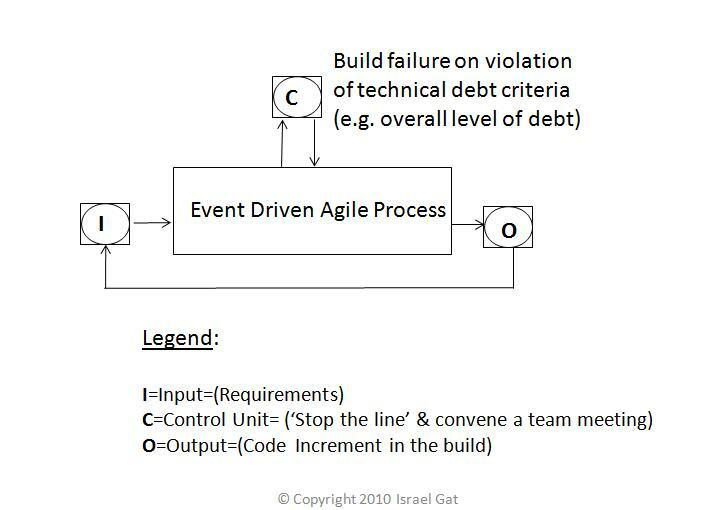 The technical debt accrued in the code is the ultimate acid test for your success with the Agile roll-out and/or with any other software method you might be using. Another important thread in all three events is a single source of truth. The technical debt data seen by the developer in the trenches, his/her project leader, the mid-level manager on the project, the vice president of engineering and the CFO/CEO represents different views of the realities of the code. Each level sees a different aggregation of data – all the way from a blocking violation at a specific line of code to the aggregate $$ amount required to “pay back” the debt. But, there is no distortion between the five levels of the technical debt data – all draw upon the code itself as the single source of truth. Do you really govern the software development process in your IT organization or do its uncertainty and unpredictability leave you aghast? Do you manage to bake in quality in every build? Can you assess the quality of your software in a way that quantifies the risk? Recent developments in software engineering and in software governance enable you to tie quality, cost, and value together to form a simple and effective governance framework for software. This webinar will provide you with a preliminary understanding of how to assess quality through technical debt techniques, will familiarize you with state-of-the-art tools for measuring technical debt, and will demonstrate the effect on value delivery when technical debt is not “paid back” promptly. Israel and John will also introduce a governance framework that ensures you can rigorously manage your software development process from a business perspective. This framework reduces a large number of complex technical considerations to a common denominator that is easily understood by both technical and non-technical people — dollars. Don’t miss your chance to get specific advice from Cutter’s experts on technical debt and toxic code. Join us on Thursday, August 19 at 12:00 EDT (see your local time here) to learn how both your software development process(es) and the corresponding governance process can be transformed in a manner that will make a big difference to your software developers and testers, to key stakeholders in your company, and to your firm’s customers. Register to attend so you’ll have the opportunity to have your specific questions answered. We’ll send you the login instructions a day prior to the webinar. As always, this Cutter Webinar is not vendor sponsored, and is available to Cutter clients and our guests at no charge. Register here. Be sure to extend our invitation to your CIO, CFO and the other senior business-IT leaders and trainers in your organization who you think could benefit from this discussion. If you have any questions prior to the program, please contact Kim Leonard at kleonard@cutter.com or call her directly at +1 781 648 8700. You won’t miss out — the recording will be added to the webinarsonline resource center for client access, along with the rest of these past events. Should You Invest in This Software?! Consider the following scenario: You are a venture capitalist. One of your portfolio companies has been working for a few years on a promising software application. Various surprises with respect to schedule and functionality have been sprung on you along the way. The company now asks for one last shot-in-the-arm in order to get the product out the door, market and sell it. Should you open your wallet one more time to fund this alleged last push? Israel, I have a warehouse of software products that never generated a dime for me. A company expects to ship 500K lines of code in 6 months. The company asks for additional $2M to complete development and make a significant resound in the market. To assess the investment decision, apply the code analysis techniques described in Using Credit Limits to Constrain Development on Margin to quantify the technical debt. 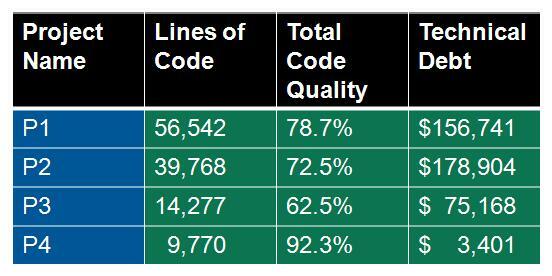 Assuming a debt of $2 per line of code has been identified, the overall technical debt amounts to $1M (2X500K). The investment decision then is not an incremental $2M decision. It is actually a $3M ($2M+1M) investment decision when the technical debt is taken into account. 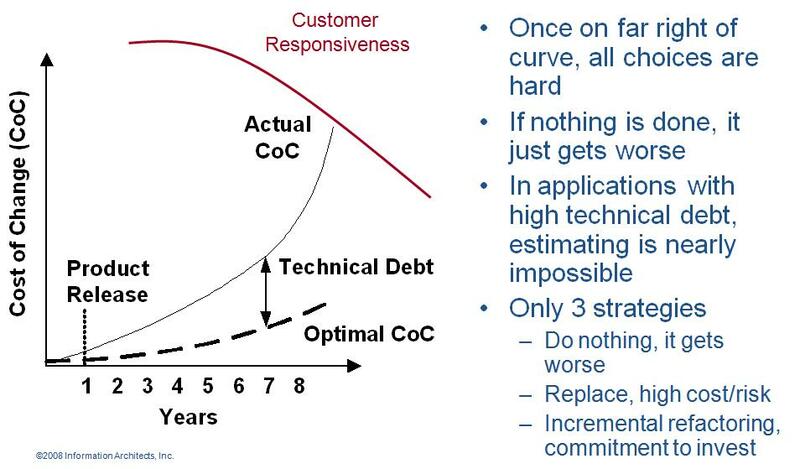 The technical debt might not need to be paid overnight, but it will have to be paid back over a period of time. The team might not hire additional resources to reduce/eliminate the technical debt, but the team resources dedicated to reducing technical debt will not be available to carry out other assignments. Hence, the opportunity cost ($1M) is real, relevant and should be taken into account. What will it take to start afresh? How should work on reducing/eliminating technical debt be interleaved with other pressing work such as new functions and features? Given a $1M debt on 500K lines of code, can the company indeed ship as expected in 6 months? We will address these three questions in forthcoming posts in The Agile Executive.